Accessories completes a look. No matter how expensive and stunning the dress is, without the right jewellery or accessories the look can be as you desired. You may have noticed how accessories can instantly boost your look. I will introduce this new online shopping site for jewellery with semi-precious stone called StyleAura. It’s a shopping site that every semi-precious jewellery lover would love to explore. StyleAura has semi-precious stones craved out and designed in beautiful jewellery that leaves a mark and makes a perfect statement piece. 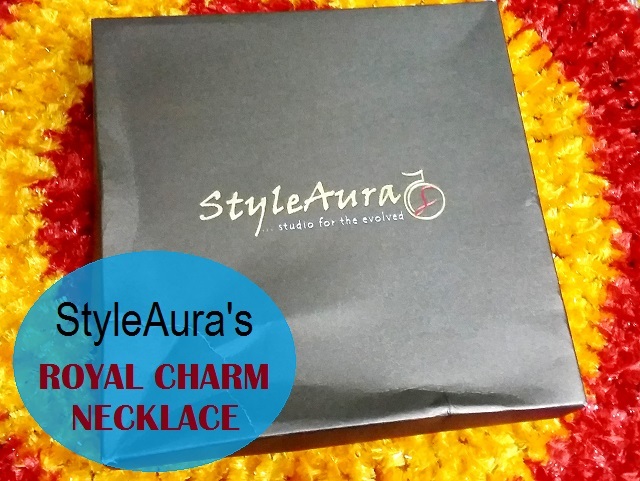 The person behind StyleAura is Ruchi Kochhar who’s a jewellery designer, counsellor and a Reiki practitioner. If you live in Bangalore, you can also shop by walking in at her exclusive designer store that is situated at Whitefield Main Road. By the way, I am actually getting late in posting reviews these days since my laptop crashed and my mum is also not at home. So, please be patient, if I have not replied to your mails/queries. Anyways, I got this beautiful pearly necklace “Royal Charm”. I chose this as I thought it will be good to gift to my mum who likes pearly stuff. Price: Royal Charm costs 2400 rupees. You can get a discount of 250 rupees on your order though one time discount per Email address. The product arrived safely in a carton box bearing StyleAura’s Logo and inside resides this pearly beauty. 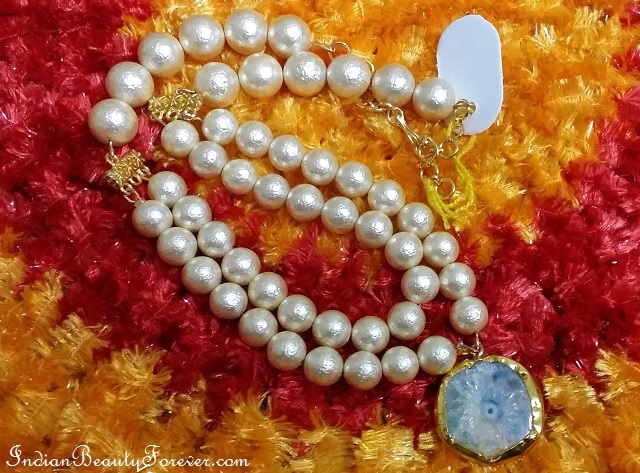 The pearls are off white in colour with gold sheen and texture. 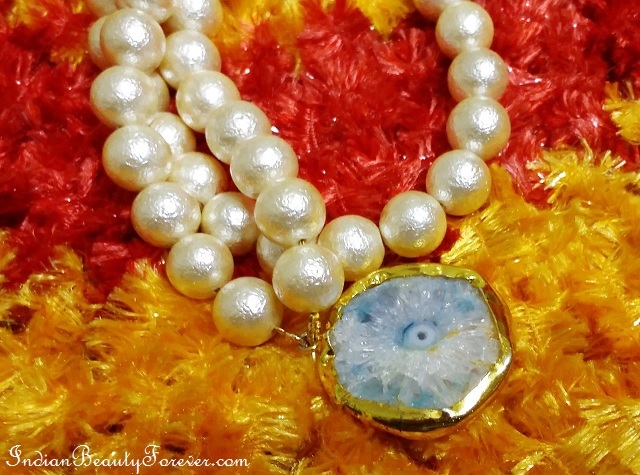 The texture makes them stand out from the regular pearls that we use normally. 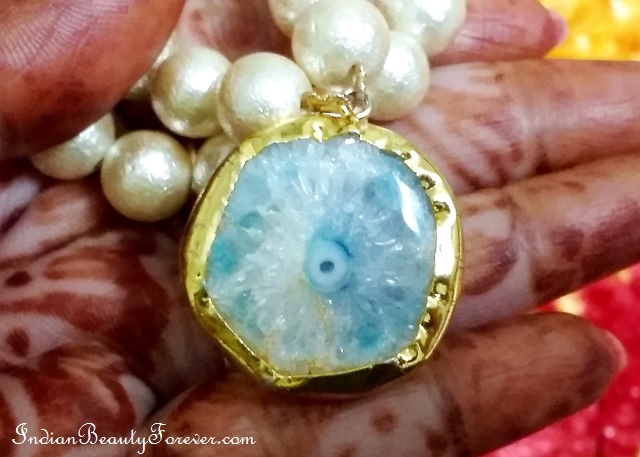 The beads are slightly bigger that the actual pearl size and in the middle hangs this gorgeous blue Druzy stone. This stone is the highlight of this necklace. I like that the thread that keeps the stones together is a metallic string that also adds on to its durability. I liked that the quality of this necklace with semi-precious stones is up to the mark considering its price. This can be worn for formal occasions like meetings, gatherings, parties etc. Such necklaces are great to have that delicate feminine look which can be carried off easily with a sari or with a beautiful gown or dress. I liked how the quality speaks for the product. 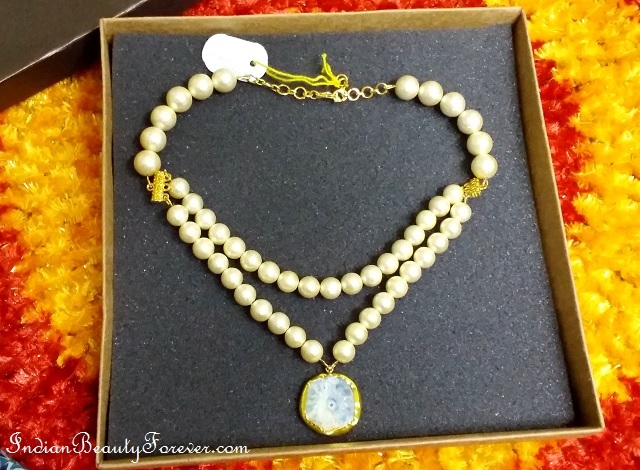 The gold textured pearls exude sheen and can be used by women of all complexions. The necklace in itself is a statement piece that can allow you to tone down the other accessories. I can pair this with tiny pearl studs to balance the look. Get a closer look at the stone here. My mum really loved this. Though I wished that the outer box could have been better like for storing this for later. 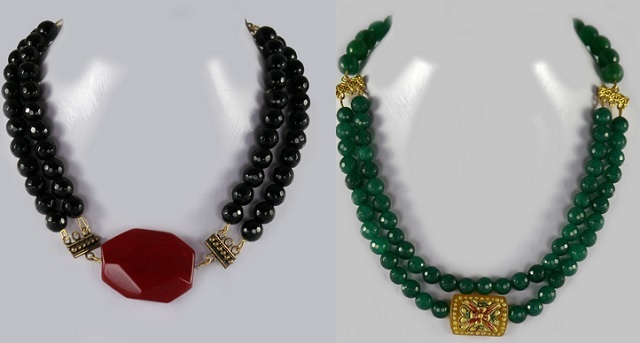 StyleAura designs use stores like Quartz, Onyx, Jade, Turquoise, Agate, Amber, Amethyst, pearl etc. I also loved few other pieces like this Red Agate two lined choker, Meenakari necklace with Amber stones. Isn't these beautiful girls!! These can be a perfect Mother's day or Birthdays gift as well. While registering at their site, you can also be a part of their Aura Club also. Now what's Aura Club? With Aura Club, you can now earn Stylee points using just your email address. As and when you shop on StyleAura online, you begin to collect Stylee, which can be exchanged for Discount coupons any time. The Coupon code then can be used to get discounts on further shopping online on StyleAura. So more online shopping will mean more discounts! PR sample!! Though the views are honest as always! !